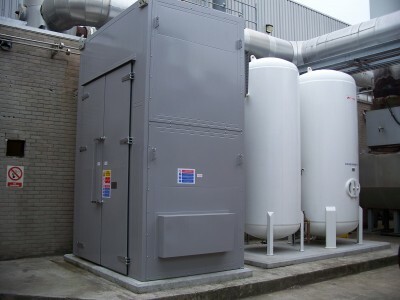 An acoustic enclosure for a Nitrogen Pressure Swing Absorption Unit at an industrial gas suppliers manufacturing facility in Northern Ireland. The enclosure, located outdoors, to be capable of withstanding prolonged exposure to adverse weather conditions without damage, with a minimum design life of 15 years. The enclosure will house numerous items of plant and equipment associated with the gas handling process, and the unit is to provide this equipment with suitable protection against dust, dirt, debris etc. and the harmful effect of corrosion. The enclosure is to be manufactured and transported as a one piece ‘drop-over’ unit, for a craned installation over existing plant & equipment. The unit will require a set of double man-access doors to facilitate operator entry & emergency exit. The enclosure is to incorporate an internal runway beam and detachable side panels to facilitate the removal of one or two of the larger items of plant and equipment, for their periodic overhaul elsewhere. Adequate free-flow ventilation of the enclosed equipment (whilst maintaining the acoustic integrity of the enclosure) to ensure that the temperature rise inside the enclosure is acceptable and allows the housed plant and equipment to operate in a normal manner. The PSA Plant had an operational noise level of 95dB(A) at 1 metre. Due to the close proximity of a number of residential buildings, the noise levels had to be reduced to below 50dB(A) at the site boundary, approximately 50 metres away. The enclosure provided a noise reduction circa 25dB(A) at 1 metre, which corresponded to a noise level well below 50dB(A) at 40 metres and therefore exceeded the customer's requirements.